What was he talking about? A quick search on the internet, and I soon knew – the Penn Women’s Basketball team was headed to Los Angeles for the NCAA Women’s Basketball tournament! Penn was seeded 12th in the Bridgeport (Connecticut) Regional and was set to play fifth-seeded Texas A&M in the first round at UCLA’s Pauley Pavilion on Saturday, March 18. The next morning, I connected with my classmate Mitchell Kraus, C’93, and we simultaneously purchased our tickets for the game in the Penn section from Penn athletics. We were going to cheer for the Quakers at the Big Dance in Los Angeles! I posted on my Facebook page about the game, and in our class Facebook group, and soon another classmate, Jodilynn Baird Styner, W’93, had purchased game tickets as well. On the day of the game, Penn Athletics hosted a pre-game reception, and I was happy to see fellow fans Jordan Rockwell, C’00, and his wife Julie, and Harry Rosenberg, W’79, and his wife Laurie Sayet. After toasting Penn and the Quakers, we walked over to Pauley Pavilion for the start of the game. Jordan and I were excited to see the display at Pauley with the four teams competing in the first round there – and posed by the Penn Athletics logo. And then we bumped into the Quaker! The Quaker is in Los Angeles! We were excited to see that the Penn Band and Penn Cheer made the trip to Los Angeles too. Soon, the players were being announced and the game was underway. And what a game it was. For three quarters, Penn dominated the game. And then Texas A&M turned things around with just over eight minutes left to play and won the game 63-61. For a complete re-cap of the game, you can read more from Penn Athletics. While the Quakers lost, we were thrilled to watch them play in Los Angeles. This was Penn’s third NCAA Tournament appearance in four years, and this year was a successful season. The team won the inaugural Ivy League Tournament with a win over Princeton, and won the Ivy League regular season title with a 13-1 record and were 22-7 overall. Junior Michelle Nwokedi was named the Ivy League Player of the Year. The Penn Band remains undefeated! I love that Lisa is wearing a very limited edition I ❤ LA Penn t-shirt! Ivy League Champions Penn Women’s Basketball! The Women’s Lacrosse team, Ivy League Champions for eight straight years, plays today at 4 pm EST in the first round of the NCAA tournament against Metro Atlantic Athletic Conference champion Canisius. Penn is the Ivy League’s automatic entrant into the NCAA Tournament via a 9-6 win over Princeton in the Ivy League Tournament championship game last Sunday, their eighth consecutive NCAA tournament – the sixth-longest active streak among Division I schools. The Quakers (11-4) will play the Golden Griffins of Canisius at the Field Hockey & Lacrosse Complex at the University of Maryland. The Terrapins are the tournament’s top seed, and the winner of Friday’s game will advance to play the Terps on May 11. To read more about the Women’s Lacrosse team, click here and in an article from The Daily Pennsylvanian. 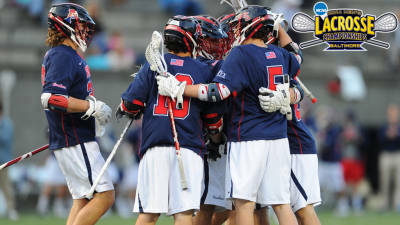 The University of Pennsylvania men’s lacrosse team makes history this Sunday, when the Quakers host neighborhood rival Drexel in the first NCAA Championship game played by Penn at Franklin Field since 1988 (a 12-9 win over Loyola). The Red and Blue is looking for its first NCAA win since that same year (a 12-9 win over Loyola), and just the third in program history. Read more about the team here and in an article from The Daily Pennsylvanian. 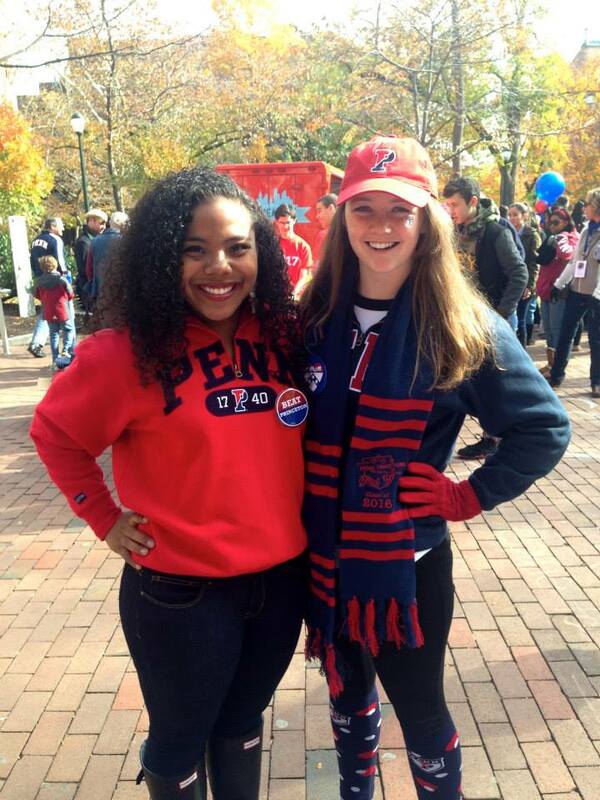 If you’re in Philly, come to Franklin Field on Sunday to cheer for our Quakers! 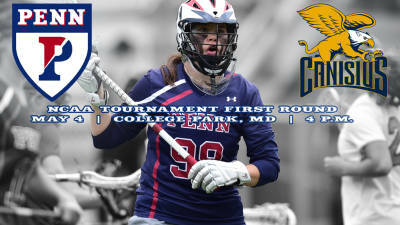 Follow both teams via their twitter handles @PennWomensLax and @PennMensLax, and look to www.pennathletics.com or Facebook for game updates. Spirits were low going into part two of Saturday’s doubleheader after Penn Women’s Basketball’s tragic loss to Princeton, 53 – 84. After two hours of cheering, screaming, and serious heart palpitations, we celebrated the Men’s big victory over Princeton, 77-74. It was a great day to be a Quaker! Join us back in The Palestra this Saturday for College Game Day followed by Penn vs. St. Joe’s at 7 PM. 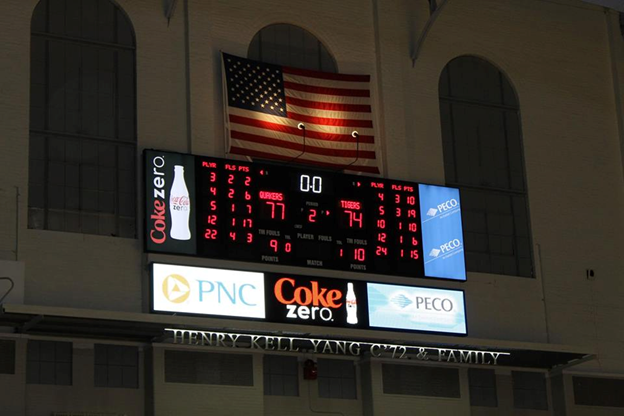 Penn beats Princeton, 77-74. Go Quakers! Penn Gymnastics will open the season TONIGHT at Hutch! Details in red later in this post. This past summer I was leaning forward, elbows on my knees, eyes wide, completely unaware of anything but the superhero-like feats of strength and agility executed by the spandex-clad individuals on my television screen during an elite gymnastics competition. This sport has always had this effect on me, as it has on many other fans, partially because the things that gymnasts do are simply not possible. And yet, there they are, doing them anyway. One particularly tiny athlete on the uneven bars did not need to pike or straddle or otherwise adjust herself quite as much as the others did when swinging around the low bar. It struck me that, if the “tall” gymnasts are 5’4”, and they have to make big adjustments, what would the fantastic gymnastic life have been like for me at 5’9 ½”, hanging from arms that are disproportionately long? 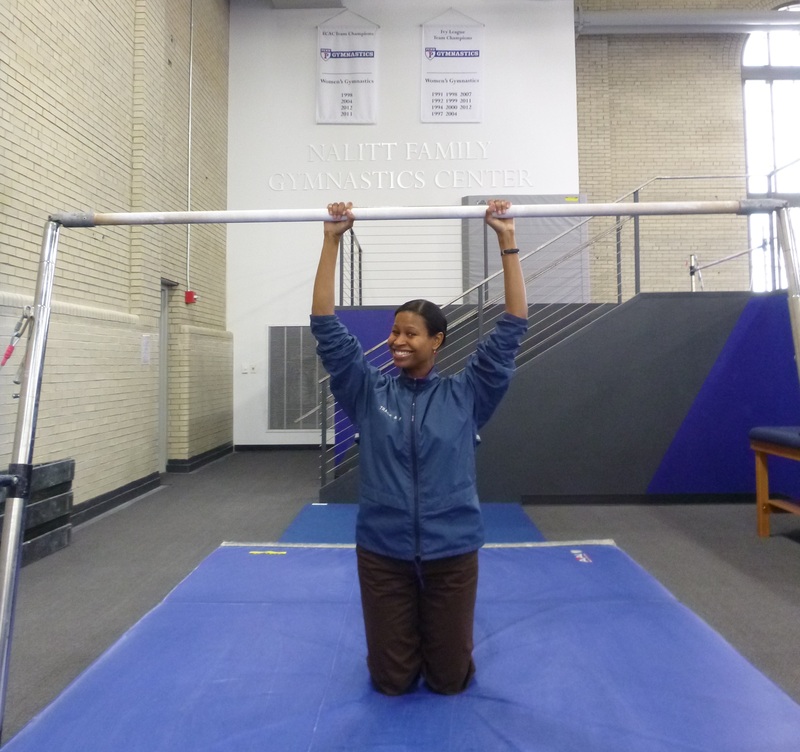 I had never seen uneven bars up close, and now I was curious to know how I, quite literally, measured up to them. Enter Penn Gymnastics Assistant Coach Kimberly Parsons, who opened the doors of the team’s brand new, shiny, spectacular new training facility to me (the Nalitt Family Gymnastics Center was made possible by a gift from Penn gymnastics alumna, and proud Penn parent, Beth (Wasserstein) Nalitt, MD). The facility was dedicated last month at Homecoming 2013, after the team was honored at halftime for winning back to back Eastern conference championships in 2012 and 2013. Yes, dear alumni. Penn Gymnastics took first place at the Eastern College Athletic Conference (ECAC) Division I Championships twice in a row, which is a first for any school in the Ivy League. 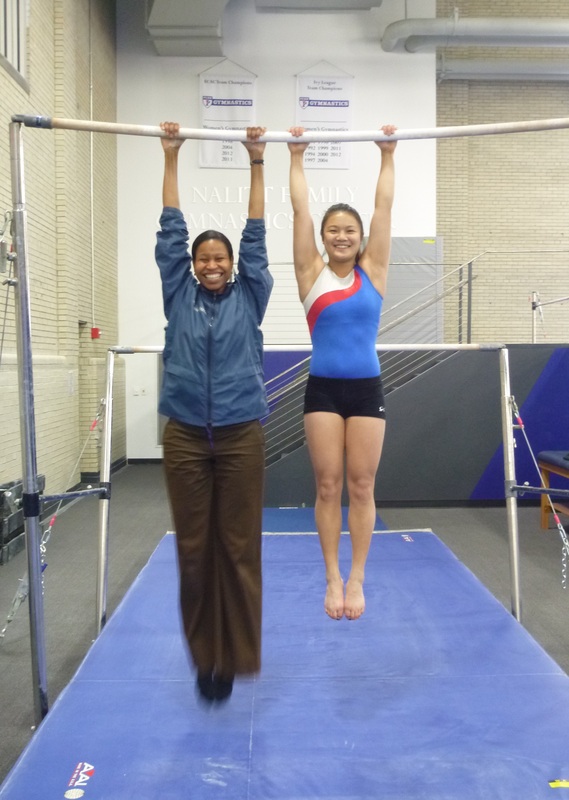 Two team members went on to win additional honors at the 2013 USA Gymnastics Collegiate Nationals. I have to draw attention to this, because, as you know, the University of Pennsylvania does not offer athletic scholarships. When one of our Varsity teams shines as brightly as this, I want the world to know! I mean, check out this hardware. 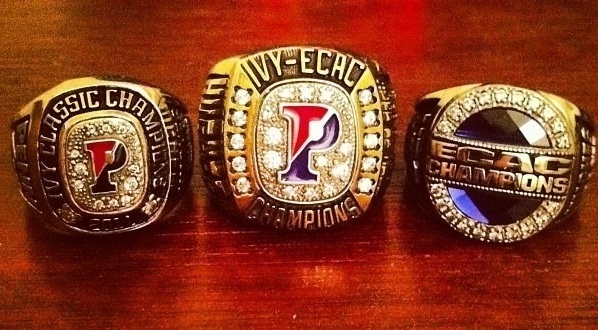 Penn Quakers earned these! I feel the need to high-five someone! Oh, these? These are just a few of their championship rings. You must see some brief clips from the 2013 ECAC Championships this past spring. Seriously. Take a moment to watch these highlights of our Penn athletes dominating the competition on each apparatus. Now I want you to see them in person so they can hear you cheer. If you are in Philadelphia, come support Penn Gymnastics TONIGHT, Friday, December 6 at 6PM at Hutchinson Gymnasium for the “Philadelphia Jamboree” against Temple University. Their next competition will be the GW Invitational in Washington, DC on Sunday 1/12 at 1PM, followed by one at home on Saturday 1/18 at noon against Illinois State. Check out the full 2013-2014 competition schedule to see when they might be near you so you can show your support wherever you can. And be sure to wear your red & blue! Let them know how proud you are. 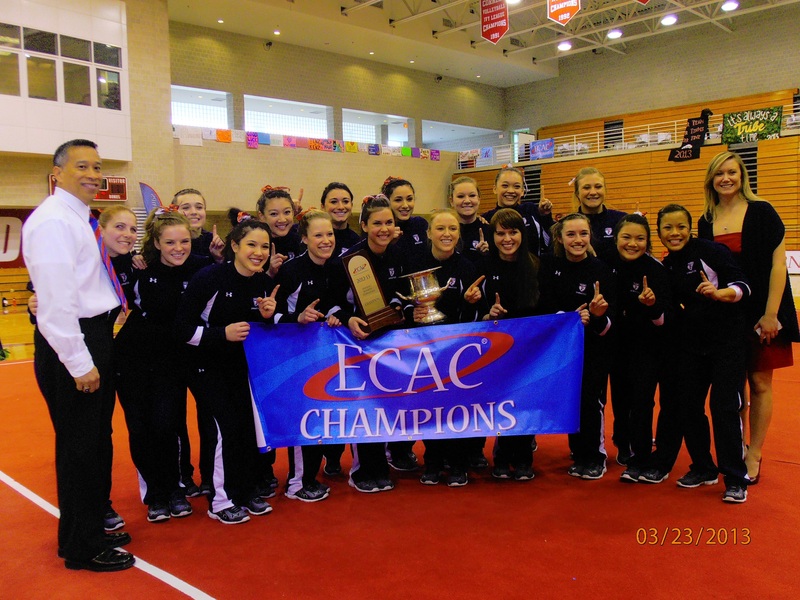 Mark your calendar for Saturday 3/22 at noon, when Penn Gymnastics will attempt to defend their title at the 2014 ECAC Division I Championships right here in Philadelphia at Temple University. As for me, here I am grabbing the low bar, from my knees, arms still bent. To be fair, there is a woman on the team who is 5’7” tall, so perhaps there would have been hope for me afterall. And they can adjust the bar height a bit depending on the athlete. Still… let’s just say I’m glad I found the high jump. For updates, you can follow Penn Gymnastics on YouTube at UPennGym, Twitter @PennGym, and Facebook at Penn Gymnastics. Special thanks to the Penn Gymnastics coaching staff for their hospitality, and I send them my very best wishes for a wonderful 2014 season! 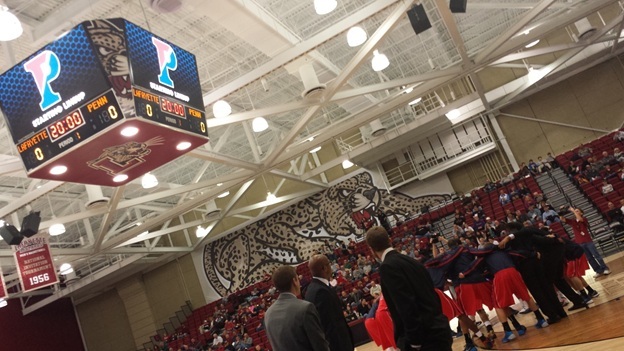 Filed under Athletics, Nicole M.
One of the best things about attending Penn Men’s Basketball away games is getting an up close look at the team during the game. This past Saturday, we made the quick trip up to Lafayette College in Easton, PA, to watch the Quakers play. 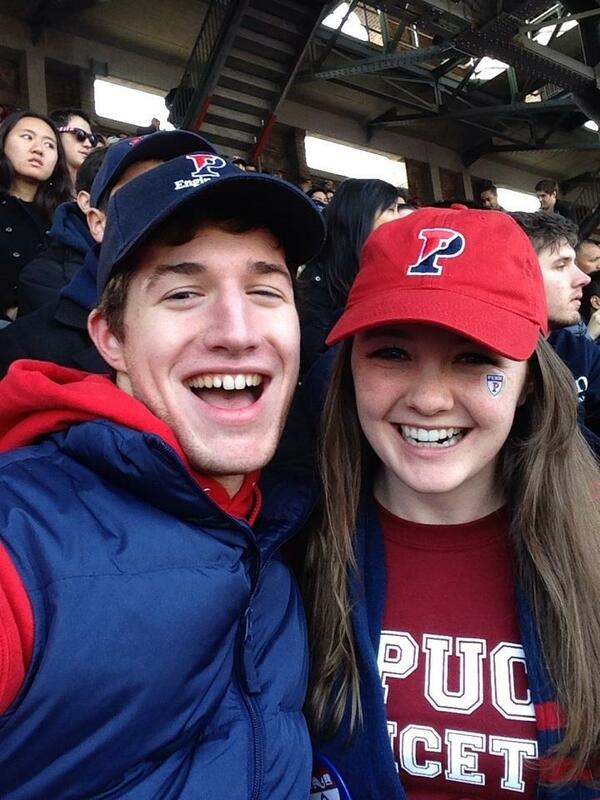 We sat right behind the Penn bench and cheered VERY loudly with the other Penn fans. Join us at the Penn @ Villanova game this Wednesday at 8pm. Let’s bring Quaker Nation to Villanova! 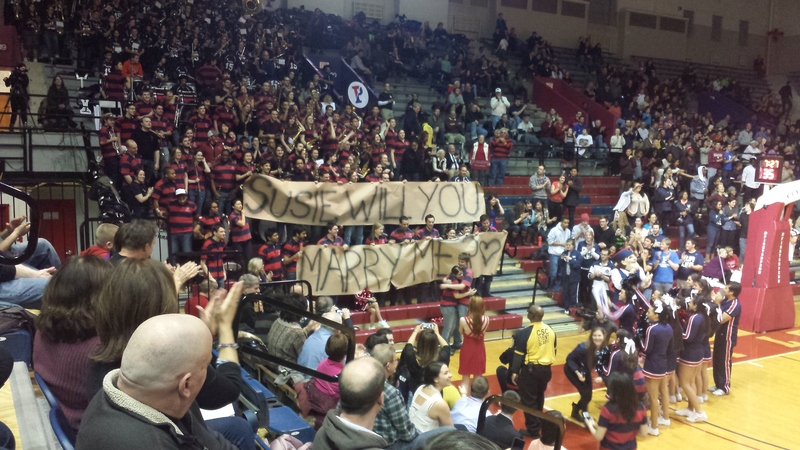 Filed under Alumni Perspective, Alumni Programming, Athletics, Penn Basketball, Stephanie Y. 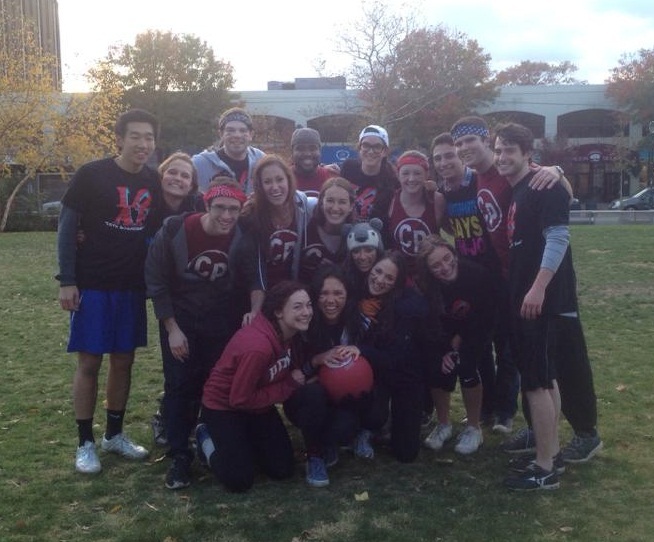 Counterparts literally kicked off Homecoming weekend with a kickball game against the Penny Loafers, a fellow a cappella group. We met at High Rise Field and played for about an hour, ending the game in a tie 3-3. It was so much fun! Who knew we could be artsy AND athletic?? I began the day yet again with Counterparts! 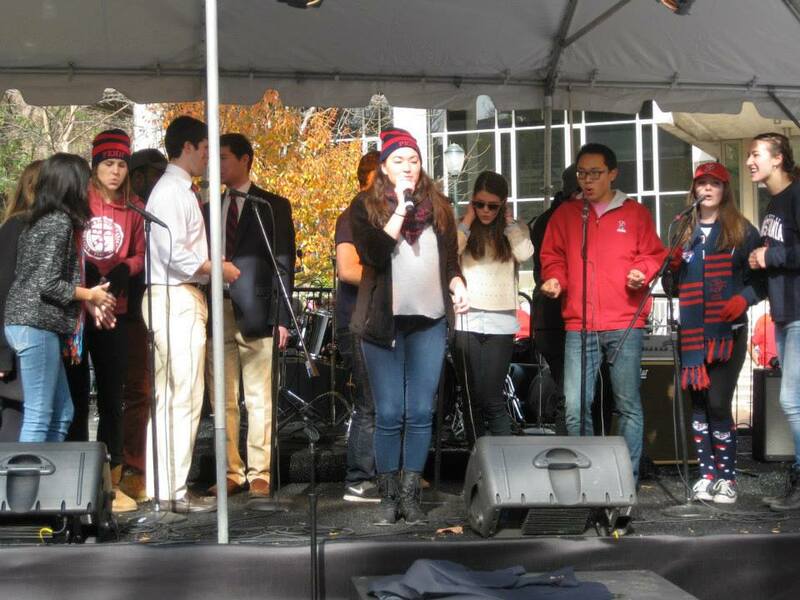 We performed a few songs from our Fall show on College Green as a part of QuakerFest. Because we were the last a cappella group to sing, we got to lead the crowd in “The Red and the Blue.” Several CP alumni were there to cheer us on! After our performance, I ran into several Sigma Kappa girls including Nikki Moorer, a member of the Class of 2016 Class Board. 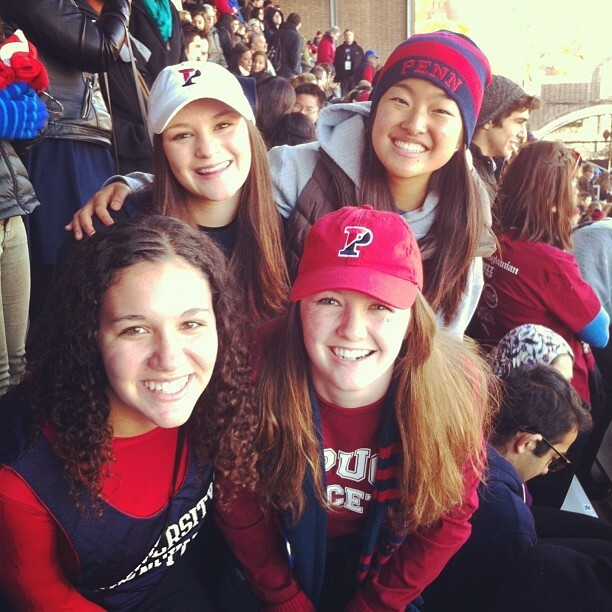 A bunch of us SK’s and CP’s then decided to watch the Penn-Princeton football game together. 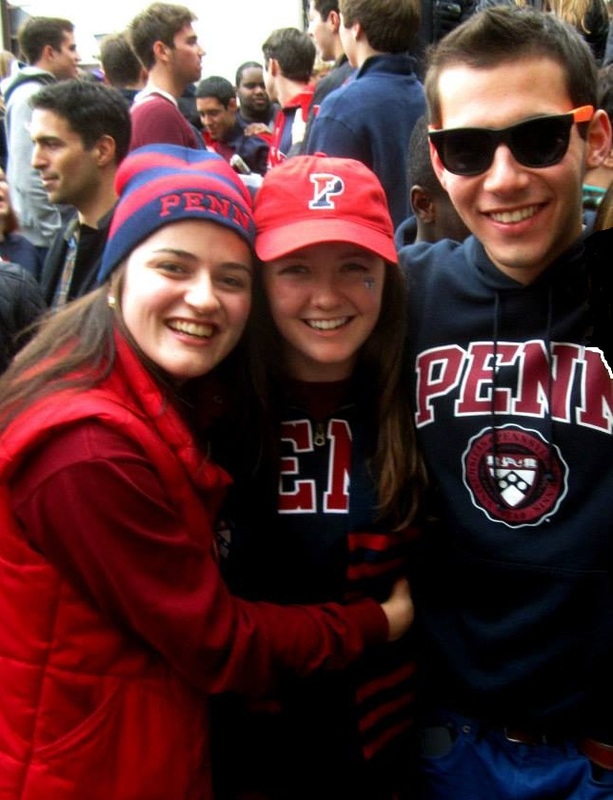 Donning my “Puck Frinceton” t-shirt, I made my way to Franklin Field with the others. Despite the tough loss, we still had really good time watching our fellow sisters in Penn Cheer, throwing toast, and cheering on our Fighting Quakers! Later that evening, a bunch of my friends went to the joint Fall show for Glee Club and Penn Dance: “Esspressionage – A Latte of Trouble.” It was fabulous! After going through my show a couple weeks ago, I can now appreciate fully the amount of effort that goes into making a production, be it singing, dancing, or theatre. Sigma Kappa welcomed back our alumni with a brunch at our chapter house! It was great to see a lot of the girls who graduated last year come out for our special alumni breakfast bagels. I may or may not have nabbed one with cream cheese and lox! After such a hectic day before, Sunday morning brunch was certainly a nice, relaxing end to the weekend. Homecoming is a blast as an undergrad. While I have no intention of rushing the remainder of my time at Penn, and I can’t wait to experience this special weekend as an alum. Hurrah Hurrah!